Whether selling a house or just trying to keep up with the neighbors, curb appeal is just as important as interior design when it comes to homes. A well maintained house not only looks great but it conveys a message about the homeowners. Create a comfortable, welcoming entrance into your home with these five tips to increase curb appeal. Overgrown bushes and trees make houses look unkempt and abandoned. Whether it’s ragged hedges or tree branches hanging over the roof, the home appears unloved and neglected. Not only does overgrown landscaping look bad, it’s bad for the house. Bushes and trees that rest against a house invite bugs and termites. A simple bi-annual trimming can keep the house looking great with minimum effort and work. Anyone who’s been to an upscale HOA housing community knows how boring a hedge-trimmed, brick-faced home with green shutters sitting next to twenty other exactly like it looks. Not only is it unimaginative, it’s dull. Make your yard come alive with color by planting an array of tulips, roses, and lilies. Creating a unique home is easy with a colorful assortment of flowers. While most homeowners worry over their landscaping, many neglect the structural edifices of the yard. A cracked and weed-eaten driveway an eyesore that should be repaired by companies like American Clean & Seal Concrete Resurfacing who specialize in driveway resurfacing. 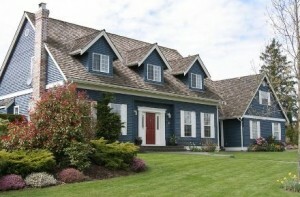 A maintained driveway creates a neat and tidy look for a home that also doesn’t ruin the car. Garages often become the resting place of scarcely used gadgets and home good. So it’s no wonder that many garages fall into a state of disrepair. A well maintained garage adds to curb appeal and is easy to update. Dirty or nicked garage doors can be easily repainted. A damaged door can be replaced with an updated look that enhances the house. When power washing the house, be sure to give the garage a nice scrub as well. Curb appeal is not only about creating a pleasing home for passers-by, a home with great curb appeal should look inviting to friends and family. Landscape the walkway for maximum warmth and comfort. A well-kept sidewalk flanked by flowers leading up to a colorful front door can make guests feel at ease even before walking in the door. Add comfortable furniture onto the front porch to invite guests to stay and relax a while.